Benjamin Franklin Fairless was an American steel company executive. He was president of a wide range of steel companies during a turbulent and formative period in the American steel industry. 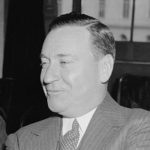 His roles included President of Central Alloy Steel from 1928 to 1930; First Vice President of Republic Steel (which had absorbed Central Steel) from 1930 to 1935; President of the Carnegie-Illinois Steel Company from 1935 to 1938; and then President, and later Chairman of the board of directors and Chief Executive Officer of U.S. Steel (the largest steel company in the United States) from 1938 to 1955.